Florida Divorce: Can I Change My Child’s Name? Following a divorce, you may be interested in changing your child’s first name or last name. While certainly not all divorcing families seek to make this type of change, it is far from an unusual decision. You may feel that a name change is best to help your child adjust post-divorce. Under Florida law, parents generally have the right to change their child’s name. However, there are some potential complicating factors that must be considered. Here, our experienced Clearwater, FL name change lawyer explains the most important things you need to know about getting a child’s name changed after a divorce in Florida. Under state law (Florida Statute 68.07), you must follow certain rules and filing procedures in order to change your child’s legal name. If you are a parent and you are seeking to get your child’s name changed with the consent of the other parent, it is a relatively easy process. A lawyer can help you make sure that you fill out and submit the forms in the proper manner. In addition, the other parent, the parent who is ‘consenting’ to the name change, merely has to complete and submit Florida Supreme Court Approved Family Law Form 12.982(d). It is extremely unusual for Florida family law courts to block a proposed child name change that is agreed to by both parents. What if the Other Parent Does Not Consent to the Name Change? 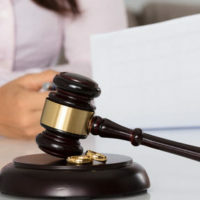 After a divorce, one of the primary challenges that a parent could face when attempting to change their child’s legal name is the objections of their kid’s other parent. If you are seeking to change your child’s name without the consent of the child’s other parent, the process will be far more challenging. This can be frustrating, but there is some good news: you do still have legal options available. At this point, it is generally in your best interest to speak a Florida name change attorney. The most efficient option is still always to get consent from the other parent. If it is possible to negotiate a settlement or agreement whereby the other parent consents to the child’s name change, that will make things must faster and easier. This option should always be considered first. Of course, the other parent may simply decline to cooperate. In these cases, there are still options available. A parent has the right to take their case to court, seeking a name change without consent of the other parent. If the other parent actively objects to the change, you will be required to prove that such a change is in the best interests of your child’s psychological health, emotional well-being, and social development. At the Law Office of Gale H. Moore P.A., our Clearwater marital and family attorney has the skills and experience required to handling child name change cases. If you need help getting your child’s name changed in Florida, please do not hesitate to call our law office at 727-584-2528 for fully confidential legal guidance.